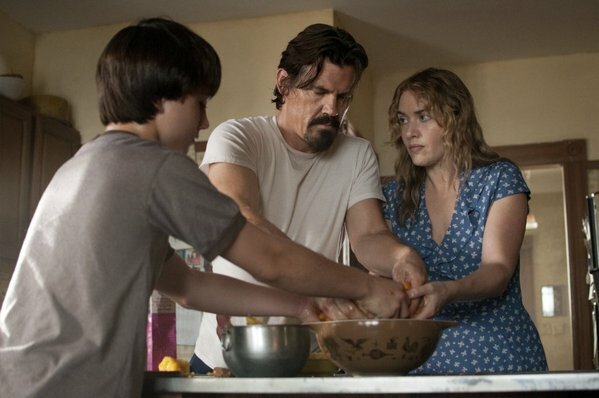 Labor Day is a saccharinely sweet, obnoxiously earnest piece of unromantic romantic tripe from a filmmaker who both can do better and is good enough to keep this from being truly awful. Jason Reitman had an unblemished track record. He burst onto the feature film scene with 2005’s darkly hilarious Thank You For Smoking, followed it up with the moving and saddening (and also, for pretty much everyone except me, funny) Juno, succeeded that with the damn near masterpiece Up In The Air and then re-teamed with Diablo Cody for the subversive and real Young Adult. His films near-expertly juggled comedy and drama, presented lovable or relatable or, at the very least, entertaining and interesting characters and, and this is something that a lot of filmmakers seem to have forgotten how to do these days so it’s worth pointing out, he knew how to craft excellent endings. That unblemished track record was no joke, you could pretty much guarantee quality if you turned up to a Jason Reitman film. The usage of the past tense in that previous paragraph is not an oversight on my part. See, Jason Reitman had that unblemished track record. Unfortunately, that unblemished track record had to grow its first zit some time, show me a filmmaker who has never made a below-par film and I’ll show you a way inside Fort Knox, and that time has finally arrived for Mr. Reitman. For Labor Day, based on a bestselling and critically acclaimed 2003 romance novel of the same name (in what must have been a really slow year for decent novels, if the evidence displayed here is anything to go by), is garbage. And yet, maybe it’s a testament to the skill of Reitman as a filmmaker that my predominate thought when leaving the cinema was not “that was dreadful and offensive sh*te” but instead “well, that could have been a lot worse”. So our story is set in 1987 and we follow mother and son Adele (Kate Winslet who, if Divergent does end up as bad as it looks, is not having a great start to 2014) and Henry (Gattlin Griffith and, yes, that is his actual name, I checked). Adele has been suffering from depression, seemingly because her husband (Clark Gregg) left her but actually because of really stupid and misguided reasons, and this renders her practically incapable of leaving the house. Henry tries as best he can to make her happier, but it’s not working and he’s at a loss as to how to make things better. Enter Frank (Josh Brolin, who I think has officially used up all of the goodwill he earned in 2007 & 2008 by this point), an escaped convict who was thrown in jail for murder that he insists is way more complicated than it sounds except that, no, it really is not. He forces Adele and Henry to shelter him at their place from the cops whilst his wounds heal over Labor Day weekend. Except that, whilst he’s recuperating, it turns out that good old Frank is actually a perfectly swell guy who fixes things up, talks politely, turns into the father figure that Henry never got, and Adele also ends up falling for him because, oh, have you seen his arms! And the way he broods! And he is just such an excellent baker! I want him inside of me, right now! I apologise for not falling head over heels for the charms of Frank, the convicted and unrepentant murderer, but this is f*cking awful. No film relationship, no convincing and heartfelt film relationship, can or should ever begin with an escaped ex-con threatening to murder the female protagonist’s son. If you’re doing it as a complex drama, that asks you to sit and psychologically analyse the two people involved and how they would reach such a situation, a character study that never explicitly asks you to empathise with or root for those involved, go right ahead. That actually sounds really interesting; get on it, Hollywood! If you’re going to ask me to sit down and root for these two lovebirds for the course of two hours, to share in their intimacy and heartbreak and to be begging for them to somehow make it work for these crazy cats even whilst this cruel and heartless universe strives to keep them apart, I am going to snort derisively and consider you a little screwed up. What part of this is romantic? Explain to me how any part of this scenario is supposed to get my heartstrings all tangled and tugged at. I am dying to know, here. Please, regale me with a thousand word essay on how this is comparable to Romeo And Juliet. They’re both doomed romances, because SOCIETY JUST DOESN’T UNDERSTAND THEIR LOVE, but one begins with a chance meeting at a masquerade ball and involves two people falling for each other in a love at first sight type deal, whilst the other comes into being through the combined efforts of Josh Brolin’s smoulder and Stockholm Syndrome. It’s romance written by and for people who either have had no actual experience with romance and love or have unrealistically high and stupid expectations for romance and love. None of this is the fault of Winslet or Brolin and probably not so much Reitman too, this sounds like an abysmal launch point of material and they’re all trying really hard to make it work, but they’re putting in doomed efforts. The material isn’t romantic and, quite honestly, it’s kinda repulsive. Not once did I buy into the affection that the pair shared for one another. Frank never seems to have a reason for why he’s so taken to Adele and Adele’s entire reasoning as to why she’s fallen for Frank can basically be boiled down to “she’s damaged goods” thanks to a horrifically misguided and melodramatic late-game reveal as to why she’s so depressed. I’m not saying that the plot point itself is the thing that should be off-limits, I am saying that it needs to be handled way better than it was here and, preferably, not used as provocative fuel for a romance weepy. And as for Frank, the convicted and unrepentant murderer? The film teases what he did by randomly strewing short, near-wordless flashbacks to his past throughout the film even though anybody who is aware that this is a romance film will have gathered what it is in about five seconds. Then the reveal comes and the film practically bends over backwards to make Frank seem totally justified, all but openly inviting viewers to join in in shouting “YEAH, TAKE THAT, B*TCH! YOU GOT WHAT WAS COMING TO YOU!” Funnily enough, I did not take this bait. And yet, I can’t muster up the energy or the passion to maul Labor Day to pieces. Maker knows I have tried, repugnant stuff is being peddled here under the pretence of “Aw! Look at the couple in all the love! All the love! So much love!” But I can’t and that’s because the film is too competently made and too earnest for me to get angry at. It’s not like 300: Rise of an Empire where it’s sneaking by a lot of problematic subtext without even realising it because it’s competently made, and it’s not like A New York Winter’s Tale where it totally fails as a film on every basic level. No, this is a film that knows exactly what it’s doing and is completely sincere in what it is peddling in that decently-constructed product. And it’s that sincerity that makes it hard for me to get angry at this film. Even when Henry stupidly engages the shifty-looking stranger with the bleeding wound in the store instead of running away (seriously, it’s not like Frank has him cornered, Henry all but walks up to and talks to the guy); even when Frank ties up Adele and feeds her tinned tomatoes, both in a manner that, yes, is supposed to represent sexual feelings being exchanged; even when Frank leads the pair through the steps of how to bake a nice pear pie in a sequence that would be more fitting a Saturday morning cooking show; even when the film trots out a mentally disabled and physically crippled child whose mother beats him when he gets on her nerves; even when the film juxtaposes Frank and Adele’s romance with Henry’s own sexual awakening and his growing closeness to The Most Annoying And Precocious Fictional Girl of 2014 So Far; and even when the film’s romance fully kicks in and asks us to root for their planned run for the border, I couldn’t get mad. I couldn’t elicit any strong emotions either way. It’s all so… nice and pleasant. The film equivalent of wallpaper. I would have said the film equivalent of a nice warm hug except that a] I reserve that phrase for usage in reference to Studio Ghibli productions only and b] that would insinuate that I was touched by this film at some point. I wasn’t. I was mostly bored but I could at least appreciate the well-done technical side of the proceedings. The end sequence before the extended denouement is genuinely tense for a while (well, until stupid stuff resolve or complicate things), Rolfe Kent scores most of the film like a suspense drama instead of a romance flick which, if nothing else, adds a different spin to this kind of film than I’m used to, it’s very lovingly shot, Reitman keeps the pace from feeling languid, even if it never fully managed to excite or engage me and all of the cast are alright if not particularly great (the exception being Gattlin Griffith, who is just plain atrocious and could give Twilight-era Kristen Stewart a run for her money in the Dull Surprise stakes). If the romance at its centre was not predicated on f*cking Stockholm Syndrome, and instead on something, you know, romantic, I would give this a mild pass as a decent timewaster, even if it is rather dull. But I keep coming back to that premise and I just can’t get over it. It’s not romantic and the film can’t compensate for the lack of romance in that premise by injecting some believability into proceedings, instead resorting to tired and manipulative melodrama. Here are three people who fall in love because the woman likes the way he smoulders, the man likes the way she loves him for his smoulder and the son loves him for being a man and stuff… despite the fact that the man coerced them into hiding his murdering arse from the police and repeatedly threatens to kill them if he is exposed. I’ve been racking my brains trying to figure out exactly why 300: Rise of an Empire’s misogyny and racism irked me into a ball of white hot rage despite it being well-made disposable nonsense and yet this, with its toxic romanticising of murderers and escaped convicts and damaged women who need a good smouldering man to repair them, can barely get me to shrug my shoulders in disgust, but I’ve still yet to figure it out. The best reason I’ve got right now is simply the fact that Labor Day is so well made that I can’t really feel the need to get exasperated about it or anything. It’s so well made, that if the romance at its centre were predicated on almost literally anything else, and even if the execution of that new romance was still as unconvincing and mediocrely done as it is right now, I’d probably be giving it a mild recommendation. But it’s not, and that’s what sinks the film. It’s not enough to get mad and angry and hollering and hooting in rage, but it’s not decent enough to be worth your time despite the premise. Jason Reitman has finally got a black mark on his directorial record. Let’s hope it’s his last for a long while. Callum Petch has got the game spiced like ham. Follow him on the Twitters (@CallumPetch)! Good review Callum. The performances from both Brolin and Winslet were good and adult-like, but I feel as if the movie never quite got that spark going where we absolutely felt the insane sexual-tension that was constantly brewing between the two. Instead, we just get a lot of long-stares and pie-making.